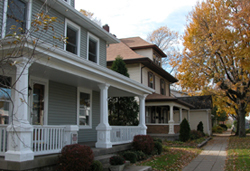 Cumberland Historic District on the Indianapolis far eastside straddles the historic National Road and is named for the city in Maryland where construction of the National Road began. The district retains a contiguous collection of buildings that illustrate Cumberland’s growth from 1880-1950. Cumberland was founded to support transportation. The district represents the impact that changing modes of transportation had on Central Indiana and includes buildings from the plank road, railroad, interurban, and auto eras. In 1806, Thomas Jefferson authorized the Congressional act that called for federal construction of a National Road to connect Cumberland, Maryland with the Mississippi River. Within the plat of Indianapolis, the National Road was called Washington Street; later, the entire length of the road within Marion County was named Washington Street. By 1829, the route was complete through Warren Township in eastern Marion County. Samuel Fullen registered a plat for Cumberland in 1831. The village had a toll house, wagon makers, inns, and stores that catered to westward travelers on the National Road. The Pennsylvania Railroad bypassed Cumberland on the south edge of town in the early 1850s. But the National Road once again became a significant transportation route when, in 1900, the Terre Haute, Indianapolis, and Eastern Traction Company began interurban service right in the center of the road. Interurbans were self-propelled, light electric train cars that connected cities. They made 9 stops per day in Cumberland, including several light freight runs. The advent of the National Road as a major federal highway for autos came in the 1920s. The National Road became U.S. 40. With increased use of the road, businesses gradually rebuilt their commercial enterprises on the route. Most buildings are not close to the curb like in urban centers, but are further away from the street, allowing first wagons, then later, cars and station wagons, to park in front. 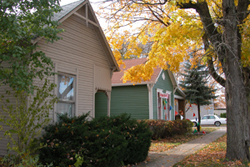 The district contains historic commercial and residential buildings in a variety of styles such as Folk Victorian, Craftsman Bungalow, American Four Square, and simple vernacular frame houses date from the late 19th- to early 20th-centuries. The two-story brick former bank building at 11810 East Washington St. is probably the best example of commercial architecture in the district. Cumberland Historic District is located on the far east side astride East Washington St. and is roughly bounded by Munsie, Welland, Heflin and Warehouse Sts. The district includes private residences and various businesses. INDYGO bus line from downtown: #8 East Washington, disembark at the end of the line.